Each year EFI hosts its customers, partners, media and analysts at its signature event, EFI Connect. The format is part trade show and part educational conference, giving EFI a chance to not only show off the latest solutions, but also to interact with customers, gather their requirements, and answer questions. EFI mounts a major troop movement to ensure that any question you have can be answered by an expert! Last year, the EFI Connect story was about acquisitions and partnerships. 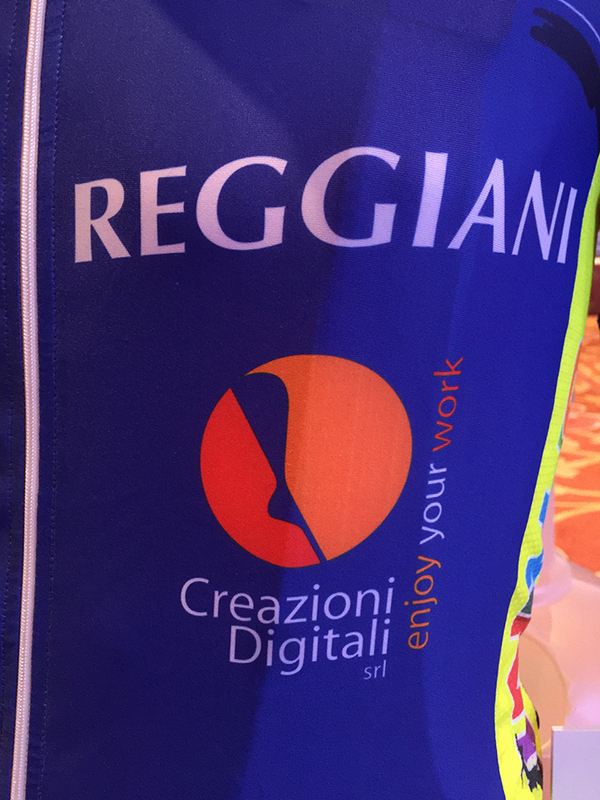 The acquisitions of Reggiani and Optitex were still fresh and repackaging of workflow software into a series of suites consumed much of the conversation. Just after the event EFI announced the arrangement with Xerox to acquire the FreeFlow Print Server and to become the primary DFE provider to Xerox. This year, while the arrangement with Flint Group to take on Jetrion sales and service is still new, the focus of the event was on strategy. It started with Guy Gecht’s keynote, The fourth industrial revolution and print. He reached back to the beginning of the EFI story in 1988, which was also when Adobe Photoshop was introduced. We were poised for a new wave of digital solutions, and now we are seeing it pick up momentum to encompass digital printing across all industries. Guy pointed out that even the definition of print is changing, taking on characteristics that allow it to participate in the growing virtual environments. There is also a growing demand for customization and personalization. He says that the plain brown delivery box will be replaced by more colorful, personal packages! “I think if you are a commercial printer, and you say I want to become a supplier to Zara, or Nike, or Adidas, that is going to take a lot of knowledge. But if you say I want to be able to do short runs, some fabrics, some decoration, you can definitely do it. A lot of signage is moving to fabric as it has a great feel, and travels well." “People found that fabric is a great way to do signage, with the Reggiani technology that started in professional textile and migrated to signage, you can do that at affordable prices, and a great quality,” said Gecht. Before Guy ended his keynote, he turned the focus to inkjet and smart automation. 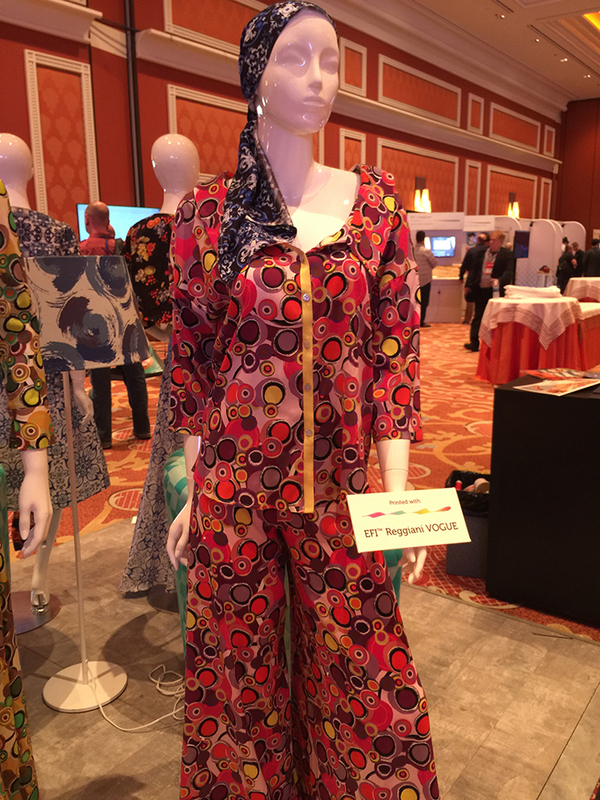 Digital textile and digital packaging production make print opportunities larger than ever before. Those opportunities will drive the EFI strategy this year, focusing on developing the investments they have made and focusing less on acquisitions. Another printed textile displayed by EFI. The focus for the Fiery team was on the bringing Fiery to all EFI platforms. With the Fiery DFE for Nozomi and Reggiani, the addition of cloud-based Fiery Navigator, and the comprehensive refresh encompassed in Command WorkStation 6, the company is positioned to deliver on their strategy, which is to enable the unified Fiery driven print room. Significant work on the operator interface, an updated RIP, support for specialty colors, the Smart Estimator and a host of new education tools round out the story. Also announced was the Fiery Textile Bundle, opening the door to clearer colors and finer detail in apparel and décor printing. For the inkjet team the focus is on expanding the markets served and activating integration with the rest of the EFI environment. They see inkjet as applicable for any substrate, with the biggest opportunities in corrugated, textiles, flexible packaging, wood panels and rigid packaging. The two newest products, introduced for this quarter, are the VUTEK HSF4, a dedicated fast four-color printer for outdoor or distant view applications that prints up to 3.2-meter-wide boards at up to 225 boards per hour, and the FabriVU 340i Soft Signage Printer. The FabriVU offering is a 3.4-meter-wide dye-sublimation printers with inline fixation and prints at up to 250 square meters per hour. The news from the Productivity Software team focused on the new suite architecture, eFlow, and object-oriented approaches that now include API support. This forms the basis for version 6 of the Productivity Suites and forms the infrastructure for the new MarketDirect platform that leverages DirectSmile but adds a host of new features for marketing communication management. In the new eFlow platform printers will find the ability to integrate with a business process management rules engine that allows for automation of common tasks. There are also a set of pre-built vendor adapters for Microsoft Dynamics, Jeeves, Sage, AccuZIP, TEC Mailing, and PrintReleaf available or in development. A key element of EFI Connect is the connection to the vendor partners and channel partners. EFI Fiery supports most of the major digital print hardware vendors, and many were onsite for discussions, including Ricoh, Xerox, and Konica Minolta. EFI also has a significant Channel Partner program to extend products like the hybrid roll/flatbed EFI Pro 16h LED printer and the new EFI Pro 24f LED dedicated flatbed printer into the market. Ricky Vescovacci, U.S. and Canada, Channel Sales Manager, shared his view of the power of the program, and said, "It’s exciting to be working closely with our Channel Partners on product launches, training and customer events such as the recent announcement of the Pro24f and Pro16h. We have a really great opportunity to capitalize on this emerging market and grow our Channel Partner business. We are building synergy with EFI R&D focused on simplifying and providing our customers greater productivity with products such as the Fiery Command WorkStation, which will operate cut sheet devices and wide format high value applications." With the complete attention of all of the business units and the support of partners, the EFI Connect event continues to grow. If you have stories to share, reach out to me! @PatMcGrew on Twitter, on LinkedIn, or Pat.McGrew@KeypointIntelligence.com all reach me. Pat McGrew, M-EDP, CMP is the Director and Evangelist for the Production Workflow Service at InfoTrends. As an analyst and industry educator, McGrew works with InfoTrends customers and its clients to promote workflow effectiveness. She also has a background in data-driven customer communication, and production printing with offset, inkjet, and toner. Co-author of eight industry books, editor of "A Guide to the Electronic Document Body of Knowledge," and regular writer in the industry trade press, McGrew won the 2014 #GirlsWhoPrint Girlie Award for her dedication to education and communication in the industry, and the 2016 Brian Platte Lifetime Achievement Award from Xplor International. Find Pat on Twitter as @PatMcGrew and LinkedIn.